Of special significance is the Chandra Mahal which overlooks the breath-taking Jai Niwas Gardens and the highly revered Shri Govind Dev Temple. The museum within the palace has an array of galleries of rare painting, exquisite miniatures, scholarly manuscripts, artifacts and traditional treatises on architecture. The fine collection of guns and swords on display dates back to the 15th century and is one of the best in India. 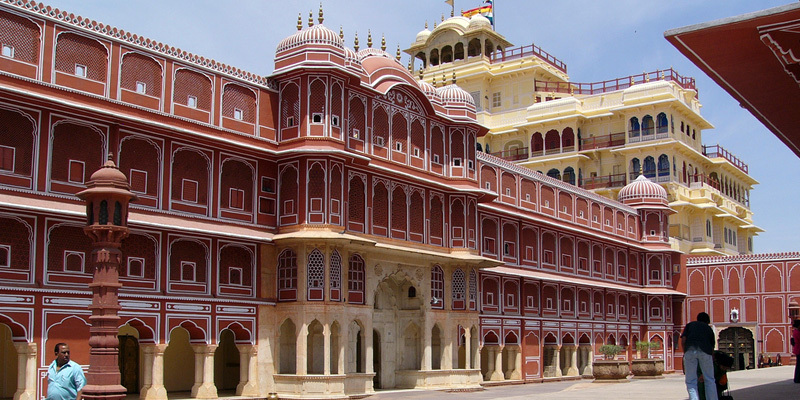 The city palace was built by Raja Sawai Jai Singh and the royal family still uses a section of the palace. The exquisite 19th century Mubarak Mahal or The Palace of Reception which used to serve as the reception area of royal guests was built by Madho Singh and is now converted into museum which show cases a bewildering array of royal costumes of the charismatic prince Sawai Madho Singh. Apart from the royal costumes, on display at the museum are some intriguing 15th century royal armory that have been very well preserved. There is also the Dewan-I-Aam which has now been converted into an art gallery and has unusual ancient Hindu manuscripts, exquisite work of art belonging to Persion, Mughal and Rajasthani school of art. The Dewan-I-Khas is conspicuous by its two large exquisite silver vessels, which were exclusively made for Maharaja Madho Singh. These vessels served the purpose of storing the holy Ganga water during the erstwhile ruler's much talked about trip to England.